what address do I use to add more money to my retirement account please? and if I started retirement in 2010 does that still make me tier 6? 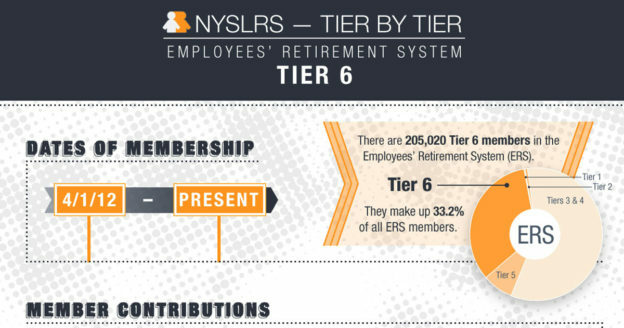 Generally, Employees’ Retirement System members who joined January 1, 2010, through March 31, 2012, are in Tier 5. Tier 5 Police and Fire Retirement System members joined January 9, 2010, through March 31, 2012. Unfortunately, you cannot make additional deposits to NYSLRS to count towards your pension. If you would like to save more toward your retirement, you may want to consider the Deferred Compensation plan, which allows you to save a portion of your gross salary before federal or New York State taxes are deducted. If you are a New York State employee, visit the New York State Deferred Compensation Plan website or call 1-800-422-8463 to learn more about deferred compensation or a similar plan. If you work for a local government, check with your Personnel office. Can you generate an infographic like this one for the 89p system for tier 6 and 3&4? Thank you for your suggestion. Please continue to visit our blog for retirement-related articles, and in the meantime, you can review your 89-p plan on our Publications page. If I put in 10 years of service to become vested and then left state service, at 55 would I then get a pension equivalent to 10 years service reduced by 52% or would it be reduced further because I left service at a much younger age? Benefit reductions for early retirement are based on your age when you retire, not how old you were when you left public service. If you have questions about your particular situation, you can email our customer service representatives using our secure email form. One of our representatives will review your account and respond to your questions. Filling out the secure form allows us to safely contact you about your personal account information.